A floods expert has called for a review of how the ESB manages flood dams along the Shannon, suggesting the authority must focus more on flood prevention than electricity generation. 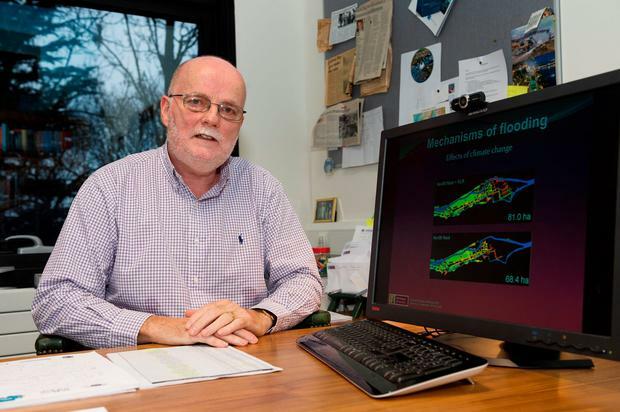 Dr Michael Hartnett, an engineer at the Environmental Change Institute at NUI, Galway, warned that countrywide flooding is likely to become an annual event as climate change leads to rising sea levels and greater storm surges. Dr Hartnett and his team have now developed a flood model so accurate that it can pinpoint how floodwaters will affect individual houses. He wants to see the model rolled out by the OPW to local authorities around the country. Speaking about the release of water from dams on the Shannon, Dr Hartnett said a discussion must start on the future role of the ESB. "Should the dams and the control of the river be focused more on flood prevention than electricity generation? They are worth money to the ESB, but they are worth an awful lot more to society if they alleviate a flood risk. I think we need to look seriously at this as an option," he said. Dr Hartnett has also developed a flood model which can pinpoint the degree of flooding and what time it will occur. The system, which recreated the Cork floods of 2009, is so precise that it can show the impact on streets right down to individual homes. "What you can do with a model like that is, say, if we put in these flood defences, if we put in a sea wall here or embankments, how does that change the scenario? Certainly from a planning point of view it is important," he added. Dr Hartnett said his model would allow them to run flood scenarios, giving them vital information on areas and specific times they are likely to be affected. "You can show individual streets and within that you can identify houses. Some of them may have basement dwelling or be low-lying and therefore you could identify these three or four should be evacuated first," he said. "We can show exactly where and when urban and rural homes are at risk and prioritise assistance in these areas. "We can also predict the velocity of the water, and that's important because if you want to send ambulances or gardai in there, it's safe for people to go in there. "With a combination of water depth and velocity, you can develop risk maps that show whether it's safe for adults or children to be in particular areas." The model can also take account of sea rises of half a metre caused by climate change. "The model looks at climate change over a 100-year period," said Dr Hartnett. "Most of the climate change in that time happens in the first 40 to 50 years. It's within our lifetime, unless things change." He said weather events leading to flooding were likely to become much more common. "One consequence of climate change is sea rise, but the other consequence is increased storminess and higher frequency of storms," he said. "So we're likely to see more intense storms happening and, therefore, flooding is going to be a consequence of that. I think it's something we shouldn't be surprised about. Year on year it's more likely to happen and more likely to be more exacerbated."